The Japanese Breast Cancer Society (JBCS) Clinical Practice Guidelines were published in Japanese by Kanehara & Co., Ltd in July 2015. This article is an English digest of the guidelines for pathological diagnosis. These guidelines are updated every 2 years. In the 2015 edition, clinical questions regarding Ki67 and cell blocks were newly incorporated. All other content was reviewed and amended based on the current literature. CQ1: Is fine needle aspiration cytology (FNAC) recommended as a diagnostic procedure for breast lesions or axillary lymph node metastasis? FNAC is recommended as a diagnostic procedure for breast lesions (Grade B). FNAC for axillary lymph nodes should be performed taking into account the sampling failure and difficulty of identifying nodal disease burden (Grade C1). CQ2: Is core needle biopsy (CNB) recommended as a diagnostic procedure for breast lesions? 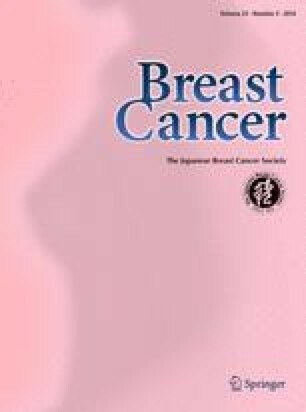 This article is an English digest of the Clinical Practice Guidelines on Breast Cancer 2015, published by Kanehara & Co., Ltd. Details of recommendation grades were explained in the previous report (Breast Cancer. 2015;22:1–4). Yoshinori Ito received lecture frees from Chugai, Esai and Novartis. He also received research Grants from Novartis, Chugai, Parexel, Esai, Sanofi, Taiho, EPS, Dai-ichi-sankyo and Boehringer-ingelheim. The other authors declare that they have no conflict of interest.